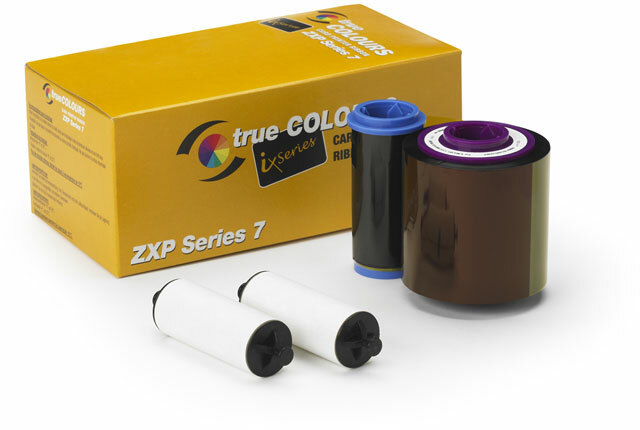 800077-770	 ZXP Series 7, IX Series YMCUVK Color Ribbon 750 Images/roll. The ribbon is used to print in a variety of colors: yellow (Y), magenta (M), cyan (C), fluorescing panel (uV), and black (K). The fluorescing panel allows for images to be seen with the presence of ultraviolet (UV) light, which adds extra security to your card. The ribbon is used to print text and full color images on one or both sides of a card. This ribbon is compatible with the ZXP Series 7 Printer. The Zebra 800077-770 is also known as ZCD-800077770	or 800077770	.